I captured this goose, landing in the water in the Orchestra position, at Bosque del Apache National Wildlife Refuge last winter. I assumed it was a Snow goose because the pond was filled with white geese that everyone around me referred to as "snow geese". Something looked a little different about this one but, caught in the moment of capturing the image I didn't pay attention to the details. It wasn't until I processed the image that I saw that it is much smaller than the Snow Goose and the beak is different. It lacks the black "lips" of the Snow Goose. This is a Ross's Goose that lives in the same habitat as the Snow Goose and sometimes cross breeds with the Snow Goose. This entry was posted on Saturday, May 26th, 2012 at 2:33 pm. 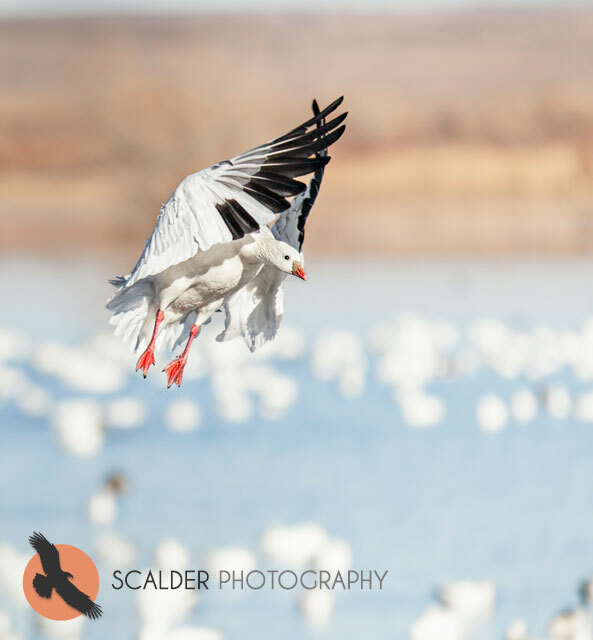 It is filed under Action, New Images and tagged with bird identification, birds, Goose landing in orchestra position, Ross's Goose, scalderphotography. You can follow any responses to this entry through the RSS 2.0 feed.